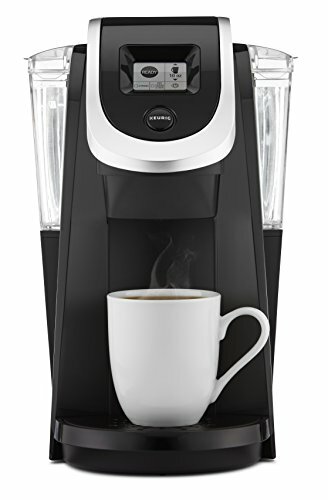 The sleek and colorful K250 is part of Keurig’s 2.0 brand line, intended to address consumer criticisms of earlier models. It’s almost endlessly customizable, with a wide range of gorgeous colors, cup sizes, and brew strengths. Unlike earlier models, however, unless you’re willing to invest time to cheat the coffee maker’s programming, it is only compatible with official Keurig 2.0 pods. Its space-saving size also comes at the expense of reservoir size, which is most noticeable when you want to brew whole carafes of coffee. Dimensions: 13.7 x 9 x 15 in. Water capacity: Removable 40 oz. Previous Keurigs came in a standard black color scheme. The K250 comes in eight different colors, including the traditional black. From bright, calming Oasis to lively Imperial Red, there’s a color to not only fit in with your kitchen decor scheme, but accentuate it and bring it to life. The K250 is billed as a single-cup brewing machine, but it is compatible with the K-Carafe line, which means you can make a cup just for yourself or brew coffee for the entire family. It also permits choices in brew strength. If you like a big, strong cup of coffee, you can make yourself one while allowing the next person to use it to brew a regular brew set for a small cup. With so many different kinds of specialized kitchen gadgets available these days, everyone’s counter space is prime real estate. 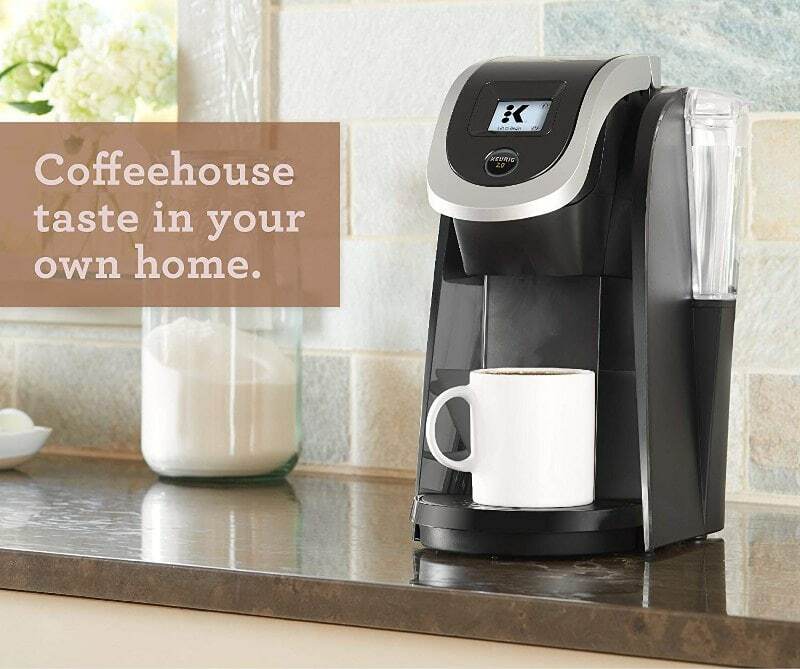 Keurig’s K250 is slimmed down to nine inches wide, so you can squeeze it in without wishing that you’d purchased a house with a bigger kitchen to fit everything in. What colors does the K250 come in? Black, White, Oasis, Imperial Red, Sandy Pearl, Peacock Blue, Turquoise, and Plum Gray. Can this accommodate non-Keurig 2.0 cups? It is not designed to use them. There are workarounds available if you really want to put the time into finding them, but there’s a reason why this is the case. The Keurig 2.0 line is designed around the ground size and the machine’s needle. Using a non-Keurig brand cup runs a greater risk of plugging the needle. Can I reuse my Keurig 2.0 pods for more than one cup? Yes, but you will probably not like the results. Keurig has taken a beating in recent years over the environmental footprint of its coffee makers. The pods aren’t biodegradable and, when used en masse, create a substantial solid waste issue. Despite that, the makers themselves continue to be very popular with the people who buy them. We checked reviews online and have collected those general impressions here. The most popular thing about the K250 is the eye-popping new color options. In fact, this was a more popular feature than its ability to brew coffee. Even people who complained about its operation said they enjoyed looking at it. Of course, people also liked its options in brewing. That is, people appreciated that one person could make a strong, large cup of coffee and the next person could get a smaller cup of regular strength. The carafe brew option was also pretty popular. There are also complaints pretty common to Keurigs in general and the 2.0 line in particular. Keurigs tend to make a lot of noise in brewing. Of course they do. They work fast. If you want fast coffee, chances are that you’ll have to accept some noise. A primary complaint about this model is that it’s only compatible with the 2.0 line of K-cups. If you have a generic brand and try to use it, you’ll have to find a workaround on the Internet, because it just won’t work otherwise. If you do this, however, prepare to deal with a clogged needle. That’s not an uncommon issue with the K250, anyway, and using the wrong-sized grounds makes it much more common. Some people also felt that this model sacrificed too much reservoir space to achieve its slim construction. It might be thin enough to fit between your cookbooks and toaster, but if you brew a lot of coffee, be prepared to spend a lot of time filling the tank. Those gripes aside, the K250 is a popular new twist on a popular consumer product. You can customize your cup of coffee in just about every way, and be dazzled by its appearance while you’re waiting for it. If you’re looking for a stylish, colorful Keurig that is slim enough to fit into the narrow spaces on your kitchen counter, the K250 is a good choice for you. It brews coffee like a Keurig, but comes in colors to brighten up your kitchen and fit into your decor scheme. It’s also customizable by cup size and brew strength, and you can brew an entire carafe. However, it can be a bit temperamental, especially if you go to the effort to use non-Keurig pods.